The 3rd and final release in the NetEnt Rocks series. Axl Rose, Slash and Jimi Hendrix have already had their share. Now it’s time for Ian Fraser “Lemmy” Kilmister and the boys to come on the stage. 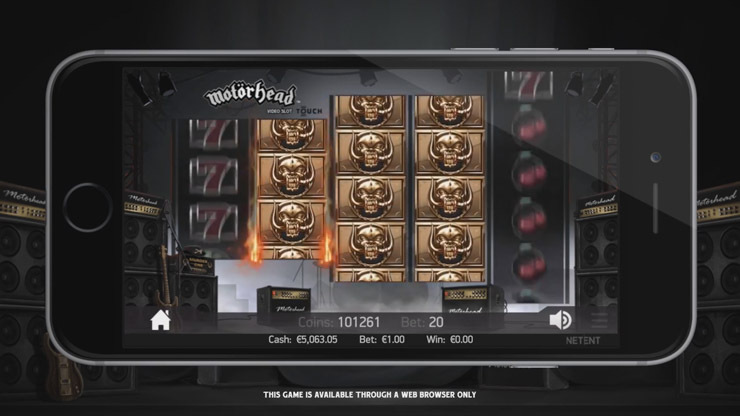 It’s the Motörhead slot and it’s already live in Flash and HTML5 at casinos like Metal Casino. As you turn on the Rock Mode and crank up the volume, here are the 5 heavy metal bonuses that you’ll come across in Motörhead. As we can see, the Motörhead (mobile) slot has an unusual set of reels. Well… here’s the official teaser. There are 76 lines that cross 5 reels, just as on the Dazzle Me slot (full review). Likewise, it’s played at 20 coins per level/bet multiplier, so the minimum total stake is just 0.20 credits. The resemblance doesn’t end there. The legendary Motörhead game also features stacked symbols that help you trigger multiple wins in a single spin. And here’s another interesting fact. The Ace of Spaced symbols is the game’s Wild card. And just like the Dazzle Me video slot, it doesn’t appear in the main game as such but only with a feature. And this is where the Motörhead stacked mystery symbol comes into play. The good news is that this is also where the two games’ roads part. Mystery symbols transform into 1 random symbol. Stacked Lemmy symbols, cherries, bells, 7’s, stars, four-leaf clovers and horseshoes is not all that’s in store for you. 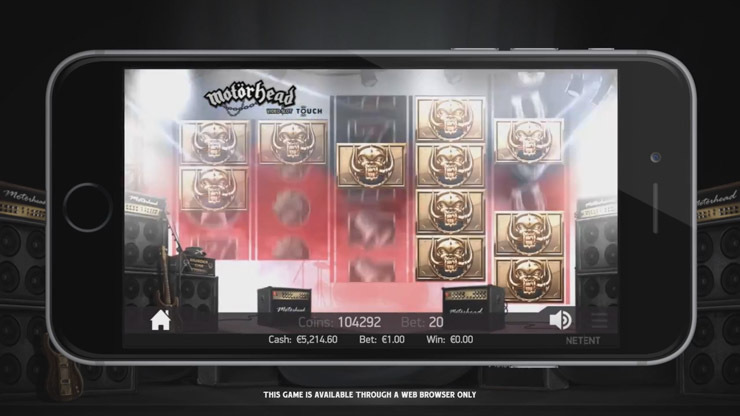 The Motörhead mobile slot also features the one and only Snaggletooth symbol, also known as Motörhead’s logo. It’s in the game’s centre attention and here’s why. The Snaggletooth icon adds a level of excitement by acting as a mystery symbol. As you can see from the image, it also appears stacked and reveals one randomly picked symbol but only after all the reels stop spinning. Who knows what’s under the symbol – it can also be Wild. Speaking of substitutions, this is one of the two instances when Wilds can appear in the base game. This leads us to Motörhead slot’s first bonus game. Mystery Reel feature adds more Mystery symbols on the screen. While the Mystery symbols are not that rare, they can occasionally go mad and trigger the Mystery Reel feature. The game will then boost the reels by adding more Mystery symbols, which in turn leads to more identical symbols and “Overkill!” celebrations like you see above. Both the Guns N’ Roses (The Appetite for Destruction Wild and the Solo Multiplier) and Jimi Hendrix (Purple Haze Wilds) slots have one or more random bonuses too. But that’s not all as Motörhead has another lucky feature for you that’s inspired by the “Bomber” single. Bomber feature adds clusters of Mystery symbols on the screen. It’s time to summon the lightning and shut down the lights. Note the sirens go off and watch as Mystery symbols start to appear in clusters across the entire reel-set. As with the above, this can happen at any point during the main game, regardless of player’s actions. All in all, this is one well-made bonus as far as special effects go. In relation to payouts, it’s only second to this one. Free Spins bonus with stacked Wilds. 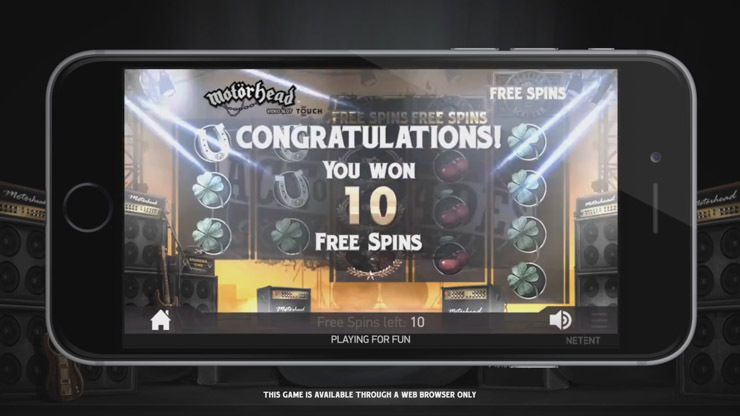 This is the only “second screen” bonus is the Motörhead mobile slot. Just like in the Jimi Hendrix counterpart, you need 3x Scatter symbol on reels 3, 4 and 5 to trigger the feature. Unlike the Dazzle Me’s Free Spins that feature the Linked Reels feature, in this rockin’ slot you’ll get a shower of stacked Wilds. Judging by the game’s video teasers, they appear on one or more reels on practically every spin. But whether the two random features are active or not is unclear – I’d guess they are. In contrast, the Jimi Hendrix slot has 3 Free Spins bonuses, whereas the Guns N’ Roses game has just one – Encore Free Spins – as well. Click to play Motörhead slot for free. 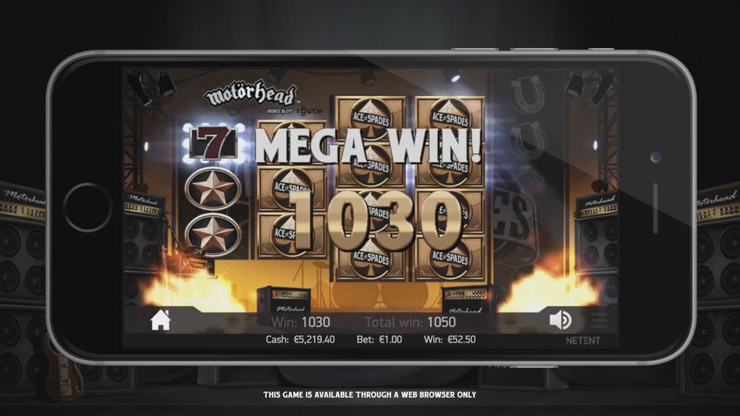 The Motörhead video slot was released on 22nd September. This date also marks the end of NetEnt’s Rock Tour, at least for the year 2016. Guns N’ Roses was the company’s biggest release ever. It’s a bit naive to expect Motörhead to be just as successful, but it definitely adds to the band’s 40-year career and should be enough to at least please its fans. All symbols appear stacked on the game’s 5 reels with 76 paylines. Snaggletooths are Mystery symbols that reveal a symbol to form clusters and create winning combos for big returns. Mystery Reel feature can kick in at any time and add even more Mystery symbols onto the screen for even bigger wins. Bomber feature is random too and it’ll strike Mystery symbols in any position for your benefit. 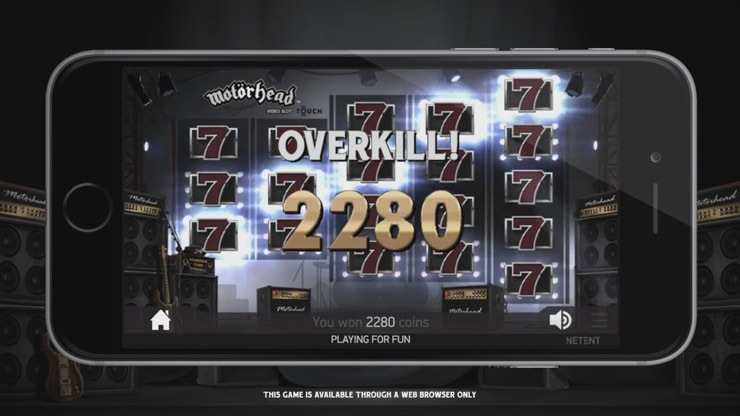 3x Scatter triggers Motörhead Free Spins with frequent stacked Wilds that can be the source of “Overkill!” wins. Play Motörhead slot for free or real money. As you celebrate the end of the rock series, stay in the rock mood with the two counterparts — Jimi Hendrix and Guns N’ Roses — and read the Dazzle Me review to see how similar the two games are indeed.